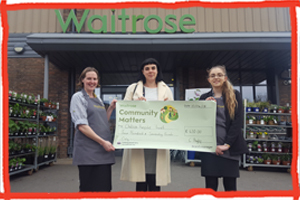 The wonderful team at Uckfield Waitrose have been such incredible supporters over the last few months, we popped our application in for the Waitrose scheme ‘Community Matters’ to the branch, and a few months later they were handing us a cheque for £440! They have not just helped us with a financial donation though, the lovely Simon and Tracey kindly put together a treat package for our Family Fun Day which included juices, teas, coffee, and such an awesome variety of delicious cakes! They have vowed to be our event sponsors for each event we host at the centre, so if we have an open days or host a parent afternoon, we will be having more scrumptious treats from the team! This is just incredible to know that we have supporters like this, that want to show their continued support for many moons to come. ← The Trust is commissioned by Taylor Tofts!